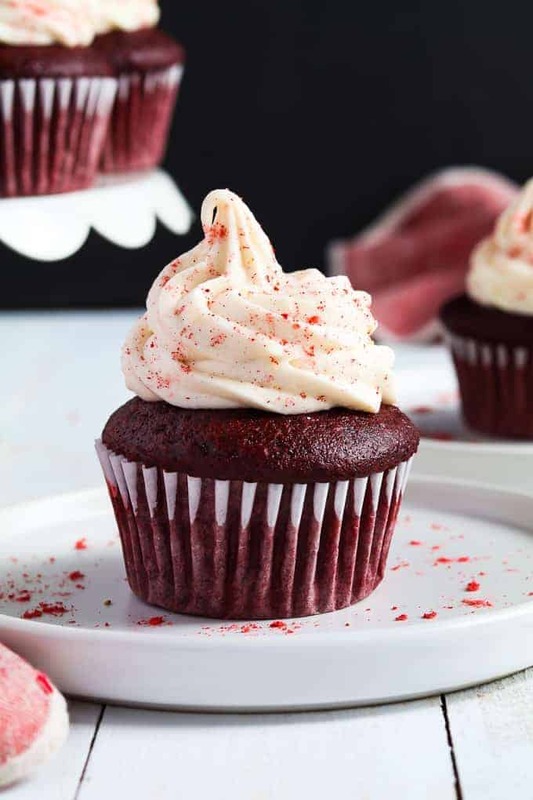 These Vegan Red Velvet Cupcakes are perfectly moist and fluffy with a subtle note of chocolate flavor. They are easy to make and downright delicious! 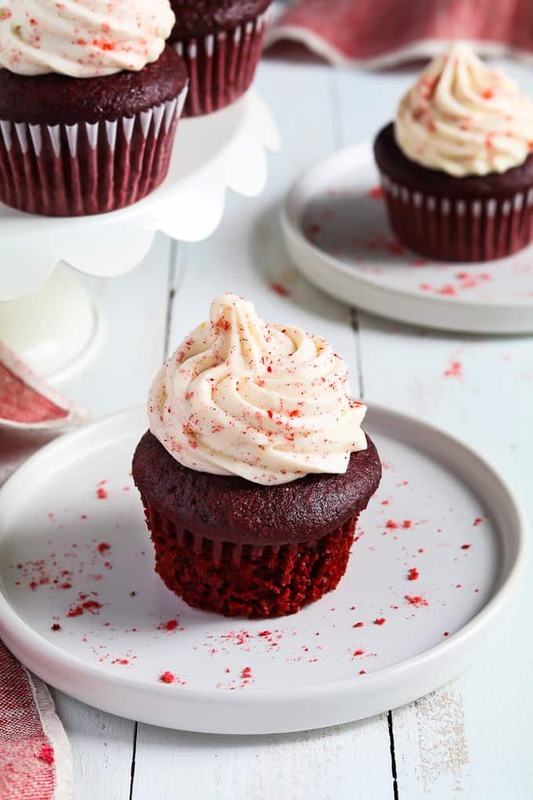 Valentine’s Day is just around the corner and red velvet is the perfect way to celebrate! It’s a silly holiday, but it’s certainly fun making sweet treats for the ones you love or for yourself. Wouldn’t you agree? 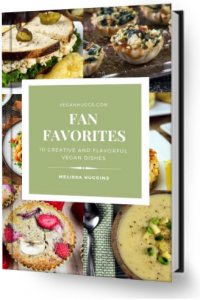 We’re staying home this year, so I’m making a batch of these for the big day and my Easy Vegan Alfredo Sauce over fettuccine for dinner. Well, they taste very similar to chocolate cupcakes except they are less chocolatey. They have a slight tang from vegan buttermilk and I like to add a little almond extract for added depth. Then you can frost them with a tangy Vegan Cream Cheese Frosting or this Vegan Buttercream Frosting that I used for my Chocolate Peppermint Cupcakes (just omit the peppermint). If you don’t have time to make the frosting, you can purchase a Vegan Store-Bought Variety to make life easier. Mix the soy milk and apple cider vinegar together in a medium bowl and let sit for 10 minutes to create vegan buttermilk. 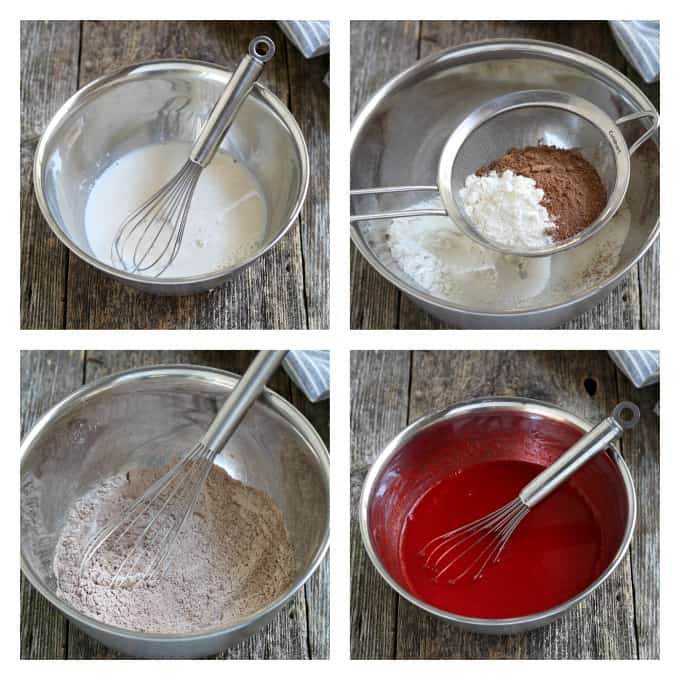 Add the oil, applesauce, sugar, red coloring, and vanilla to the buttermilk and whisk to combine. Bake at 350 °F (177 °C) for 20-24 minutes. Lightly press the surface to check for doneness – It should spring back. Let the cupcakes cool in the pan for 10 minutes before removing. Then let them cool on a rack for at least 30 minutes before frosting. 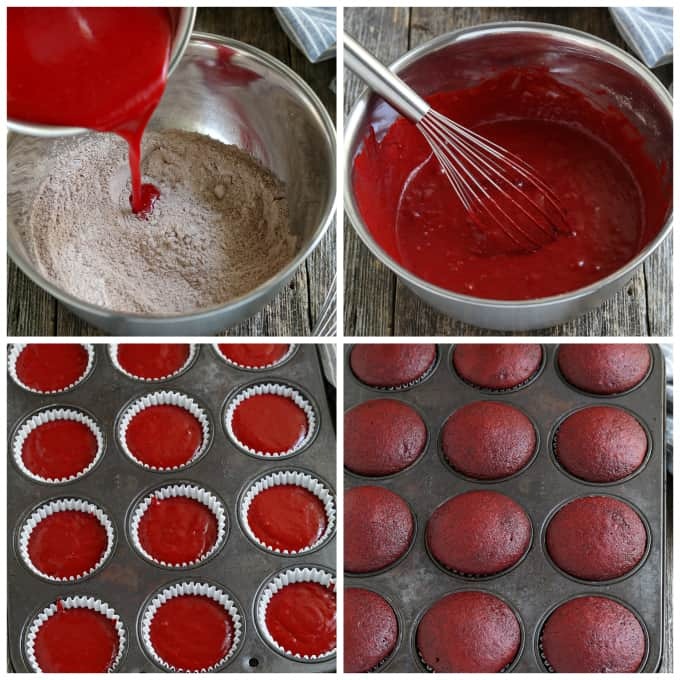 Can I make Vegan Red Velvet Cupcakes without the food coloring? Yes, you can leave out the food coloring and it won’t affect the taste at all. 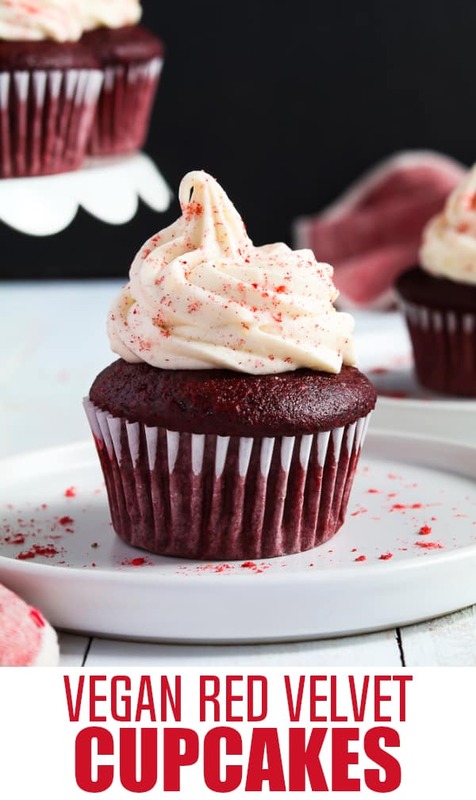 They won’t be vibrant red, but you can dress them up with cute cupcake liners and crushed dried strawberries on top. Not all coloring is vegan and may contain animal byproducts. This one by Americolor is vegan-friendly. I called the company myself to confirm. 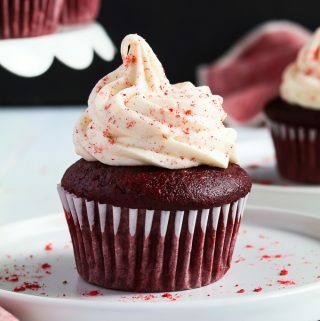 If you make these Vegan Red Velvet Cupcakes, let me know what you think by ★ star rating it and leaving a comment below. It would really make my day. You can also follow me on Instagram and share your creation with me. Just tag me @veganhuggs and hashtag #veganhuggs so I don’t miss it. Preheat your oven to 350 °F (177 °C). Fill a 12-Slot Cupcake Pan with your favorite Cupcake Liners. In a medium Mixing Bowl, add the soy milk and apple cider vinegar. Combine and let it sit for 10 minutes to create a vegan buttermilk. It will thicken and curdle slightly. Set aside. In a large mixing bowl with a Mesh Strainer on top (or use a Flour Sifter), sift together the flour, cocoa powder, baking powder, and salt. Now whisk to combine well. Set aside. In the medium bowl with the buttermilk, add the oil, applesauce, sugar, red coloring, and vanilla. Whisk to combine well. Bake them in the oven for 20-24 minutes. To check for doneness, lightly press the surface - It should spring back (You can also use a toothpick and push it through the center - it should come out clean). FOOD COLORING: I used gel coloring because it's more vibrant and only requires a few teaspoons to achieve this. If you use liquid, you will need about 2 tablespoons. Note: not all coloring is vegan. This one by Americolor is vegan-friendly. I called the company myself to confirm. You can omit the coloring and the cupcakes will taste the same, they just won't be red. You can decorate them with crushed dried strawberries/raspberries and use red cupcake liners to make them festive. FROSTING: If you won't be serving the cupcakes right away. Decorate the cupcakes and place them in the fridge for a few hours. Take them out 30 minutes before serving. This will prevent the frosting from melting. You can also frost them with Vegan Buttercream Frosting. If you want to save time, you can use store-bought Vegan Frosting. MEASURING: For accurate results, don't scoop the flour with a measuring cup directly from the flour container. 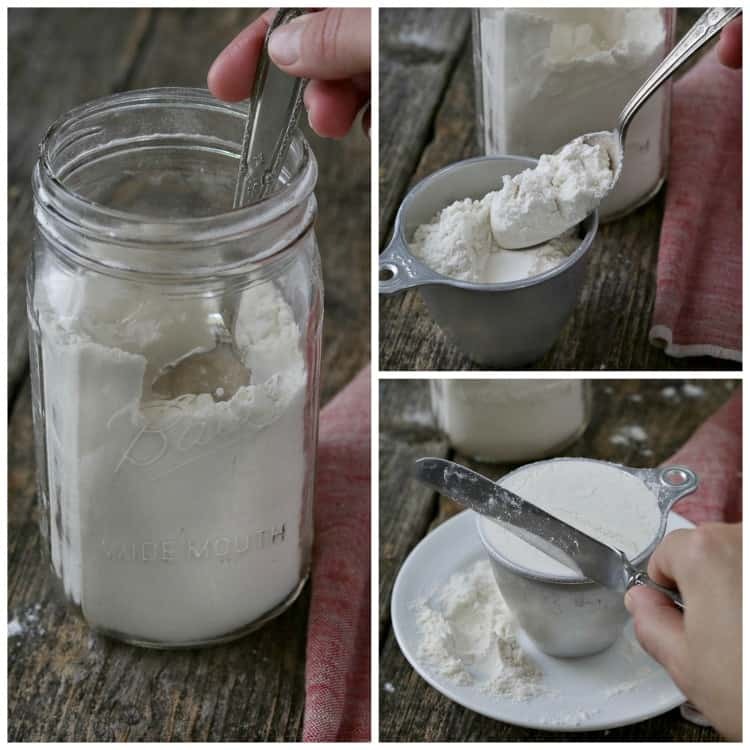 Instead, scoop the flour out of your container with a spoon and then into a measuring cup. Don't pack or tap the cup. After filling, lightly sweep a butter knife across the top to remove the excess flour. * Example photo below recipe card. Make sure your baking soda is not expired. Fresh baking agents are important for a successful baking experience. * Nutritional info doesn't include frosting. That information is in the frosting recipe card. I made these last night and they’re so good. The cupcake is perfect! I wish I could post a picture. Hi there. I am so wary about food colors I am wondering if a boiled down beet solution would work. Isn’t a red velvet cake without coloring just a chocolate cake? Hi Daisy, I’d imagine it would take a lot of beet juice to get a vibrant color and that wouldn’t work for this particular recipe. I’ve seen recipes that use beet juice and they look lovely. I do want to experiment with beets and I’ll let you know when I do. Sorry I couldn’t be more help. Yes, red velvet is just like chocolate cake, but less chocolatey. So, if you leave out the color, there won’t be a change in taste. I add almond extract for more depth too. It’s delish!